Come visit Body Masters Auto Center Inc in Santa Ana! We are proud to specialize in Auto Repair. As the premier auto mechanical and body repair shop in Santa Ana, our highly-trained automotive mechanics take great pride in supplying: Transmission Repair, Auto Body Shop, dent removal, and Brake Repair. Each of our reliable specialists undergo extensive automotive repair training to meet all your auto repair needs. The owners and maintenance experts of Body Masters Auto Center Inc have been honored to serve Santa Ana for the past 20 years. While we focus on Auto Repair, Transmission Repair, Auto Body Shop, dent removal and Brake Repair, we also provide a long range of other auto repair services listed on our services page. 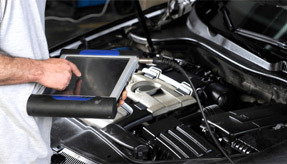 Our auto repair experts have built our reputation by providing consistently superior service here in Santa Ana. No matter what your vehicle needs, come see us at Body Masters Auto Center Inc today! From Brakes to transmission to engine work, we are the best one stop auto repair shop in Santa Ana. We provide trustworthy, fast, reliable, and quality work at the right price. Don’t just pass through; come see us for any of your auto repair needs. So remember, whenever you have a Car Disaster, bring it to Body Masters! A Satisfied C. on 9/12/2014:"Jose Chavez has been quick in responding to our requests and I was impressed by the high quality delivered."